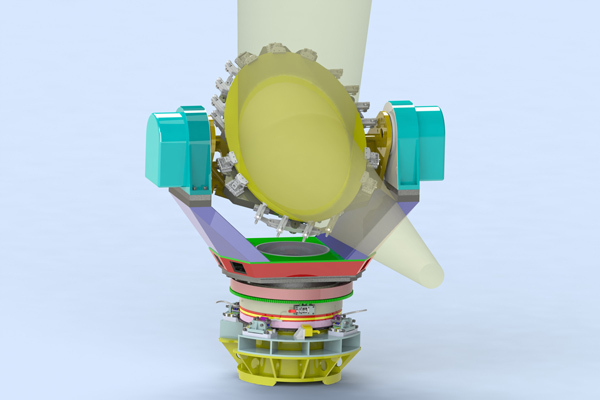 TMT GSSMP (giant steerable science mirror prototype) which will be built in CIOMP. The prototype mirror, with elliptical size of 898.5 × 634 (mm), has the function of relaying the beam of light from secondary mirror to different instruments.. The thirty meter telescope (TMT) Project is an international partnership among USA, Canada, Japan, India, China as well as other top R&D nations. The sensitivity and the spatial resolution of telescope will be improved to by far the highest altitude with TMT. Changchun Institute of Optics, Fine Mechanics and Physics (CIOMP), Chinese Academy of Sciences, is responsible for the research and development of the tertiary mirror system for TMT. The tertiary mirror system has gotten the new name of giant steerable science mirror (GSSM) because of its unique function and size. The GSSM will be the largest flat mirror in the world with the elliptical-plano figure 3.594 × 2.536 × 0.1 (m), and the first steerable tertiary mirror with such large size. The traditional evaluation method will not be suitable for such large aperture plan mirror surface. A non-correlation sub-aperture stitching method based on frequency domain was proposed, and the quality of its estimates was analyzed by the project team led by Prof. Xuejun Zhang and Dr. Fei Yang according to their previous work. It is reported in Chinese Optics Letters, Vol. 13, No. 4, 2015. The TMT GSSM could not only be qualitatively analyzed by this method, but also quantitatively evaluated with NTP (Not To Pass) curve proposed by Lawrence Livermore National Laboratory with a similar method. The team will build a 1/4 scale prototype of GSSM in CIOMP, and the evaluation method will be applied and verified in the prototype system. The researchers will spare every effort to modify and update the method with more useful features and processes to make sure that it could meet the requirements from the full scale GSSM and some other similar mirror systems.